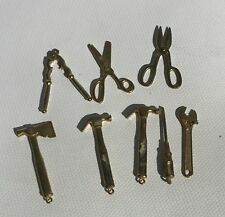 Small Brass Hammer Bottle Opener and a Brass Key. The Key Is 16.5 cm Long. The Bottle Opener is 14.5 cm Long. It is supported on a brass stand. It is hollow at the back. Miniature Brass Gavel. Good Condition - see pics. Vintage Brass Gavel Hammer Mallet 7.75"
The gong is made from brass and features a pitted star design on the front. The brass is in beautiful condition and is very attractive. The gong is suspended from the end of the tongue of an oriental face design which adorns the oak mount at the top. 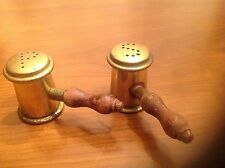 20 Small Brass Bells All With Hammers.all Ring.good Condition . Condition is Used. These range in size from 3 1/4" tall to 1 1/2" tall. from 1 1/4" wide to 1" wide at bottom of bell. rim's are smooth, scalloped, beveled.all bells ring all are brass. A fun project to be hgv and with thiscgreatcgroup of bells. Overall piece is in very good condition, excellent sound. They are 2" Tall and 3 1/4" Wide. 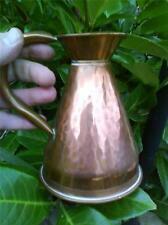 It is a lovely piece for use in the kitchen or bar.